Consider decorating your home with the Celtic Skull Votive Holder which is a modern interpretation of medieval decor. A stunning candle holder that is inspired by ancient artwork is sure to enhance the look and feel of any room. Brighten a room with the subtle design of the stylish Grim Reaper Candle Holder, which can accent the look of any room. This unique home accessory is sure to become a conversation piece when friends see it proudly displayed. The hand of Asrael is the guiding light for the Day of Judgment, serving to steer the penitent to lands east of the sun and west of the moon. 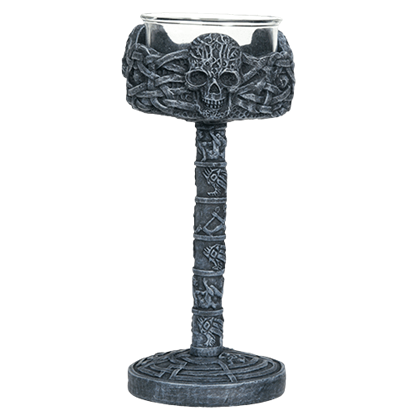 This Light of Asrael Candle Holder emulates his warm, guiding glow in your home. In swirling purple robes, the skull faced reaper sits in contemplation. 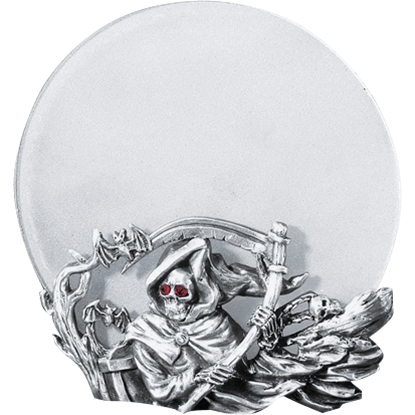 The Purple Reaper Votive Holder depicts this iconic figure of death on a stone-like base, situated to gaze at whatever votive candle you place in its basin. 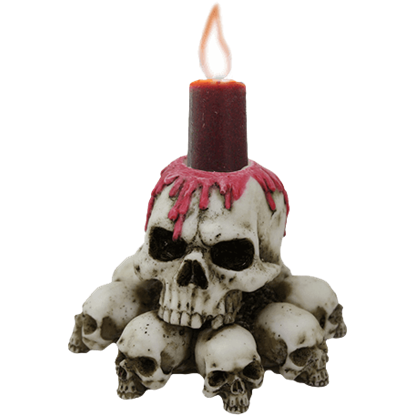 Whether you need some spooky illumination for a Halloween party or want to decorate your home in the style of a haunted mansion, the Red Wax Skull Candle Holder offers a way to combine your appreciation of horror with your home decor. 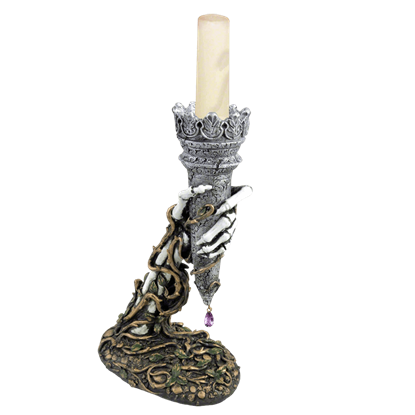 For those situations where you need a helping hand and extra light, this Skeletal Hand Candle Holder is what you need. 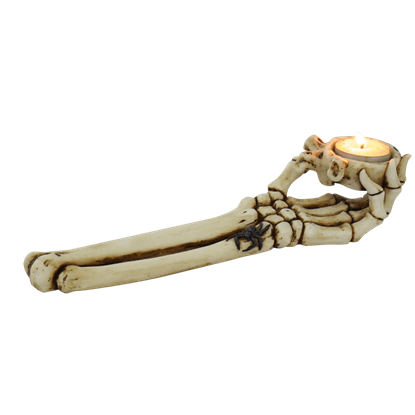 This bony arm holds aloft a cup that is perfect for burning tea lights, as well as small candles. There are a never-ending supply of spooky decorations to bring a variety of looks and feels to a room. 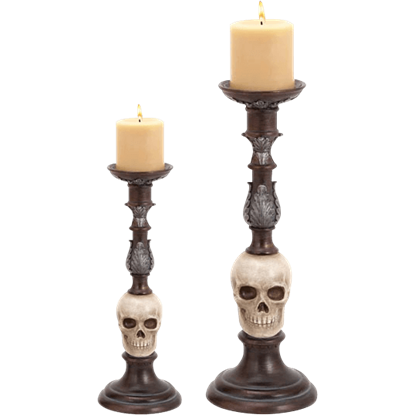 Our Skull Candlestick Set is a unique decor choice that feature two matching ornate candlesticks with human skulls. 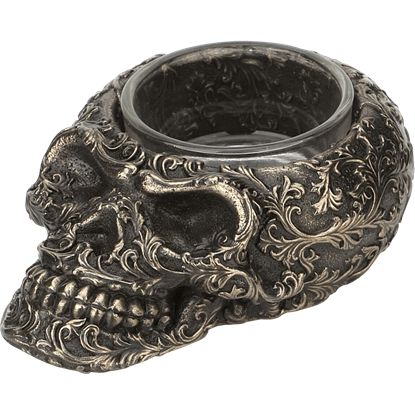 Before telling your next scary story to your friends, make sure you pick up our Skull Tealight Candle Holder. 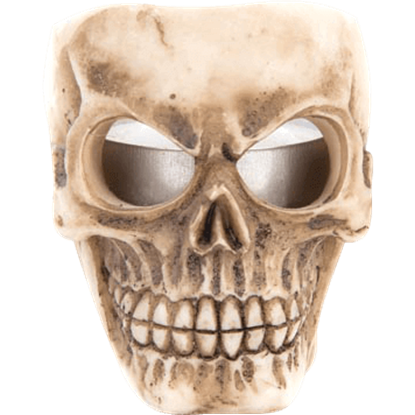 It features hollow eye socket openings and an exposed cranium which brings it to life as the perfect accent to an eerie decor. 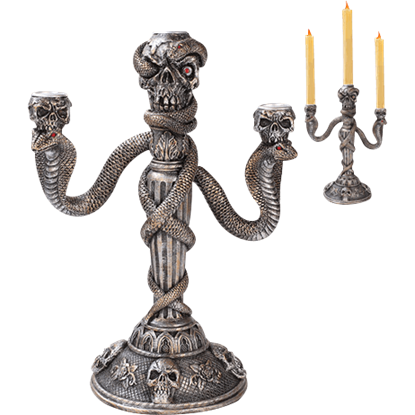 Every table needs an eye-catching centerpiece, so why not make yours the Snake and Skull Candelabra? Your guests will be sure to marvel at its unique design and spooky Gothic features as they wine and dine at your next gathering. The brain is a special organ, keeping the spark of life within us and setting fire to our thoughts. 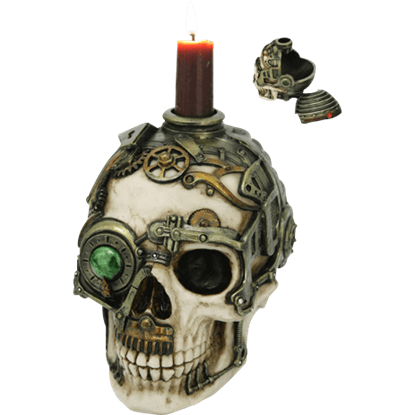 The Steampunk Skull Candle Holder replaces the brain with a tea light, allowing you to offer enlightenment in a different way. In the future, when the apocalyptic steampunk lifestyle comes into fruition, even the remains of the dead will be mechanized and brought back to life! Showcasing that look here is the Steampunk Skull Trinket Box and Candle Holder. 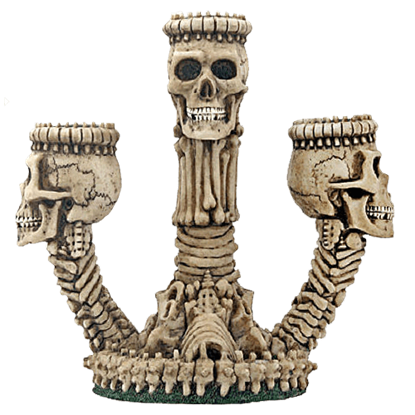 Pay tribute to a traditional funeral method with the stylish and unforgettable Triple Skull Candle Holder. Based on ancient practices this item provides your home with a unique skeletal decoration, which is sure to shock your company.